When it comes to death metal, the veteran names rule the roost…Cannibal Corpse, Grave, Immolation, Incantation and so on. It’s very tough for a newer act to break through and make a real impact. But it can be done. And Necrot from southern California are doing it. This three man wrecking machine draws its influence from the very best of death metal history and blends it into their own sinister stew. Their new album “Blood Offerings” is about as pure a DM record as you are likely to hear and truly worthy to be mentioned with the greybeards of the scene. WORMWOOD CHRONICLES: The new Necrot album “Blood Offerings” is quite a big step up for the band. How did you guys get yourselves psyched up to perform on this album? LUCA INDRIO: Thank you. We definitely took a different approach to doing this album as opposed to the tapes we did before. Before, we were just doing three songs and going to the studio to record. This time we had to write a whole album and I really wanted it to be awesome so I took extra time to make sure everything sounded the way we wanted it to. WC: The final product turned out great. Did you have the feeling when you were in the studio that this was going to be something special? LI: Yes, I did have that feeling that it was coming along really good. Halfway through the process we realized that it was going to be HEAVY. WC: What is it that makes the perfect death metal record? LI: To make the perfect record? It’s really hard to make a record that is objectively good, that everybody likes. Everybody’s got their own taste, especially with this kind of music where there’s so many variations on the genre. Some people that like rough and organic production think it’s a great job. Others who like the production a lot more clean with triggered drums and whatnot are going to think it’s no good. We definitely took the best of what we liked and the final result is something valuable. WC: Were there any classic death metal albums of the past that inspired you when you did “Blood Offerings”? LI: There were a lot of great albums that influenced the way we sound as well as my life in general. The first record that really got me was Death with Chuck Schuldiner’s “Scream Bloody Gore”. Immolation, Obituary…early Sepultura was another great influence that really got me into making fast and aggressive music. I definitely don’t come from a background of cleaned up productions. I’m also into some more modern sounding metal, but mostly it’s a rawer sound. 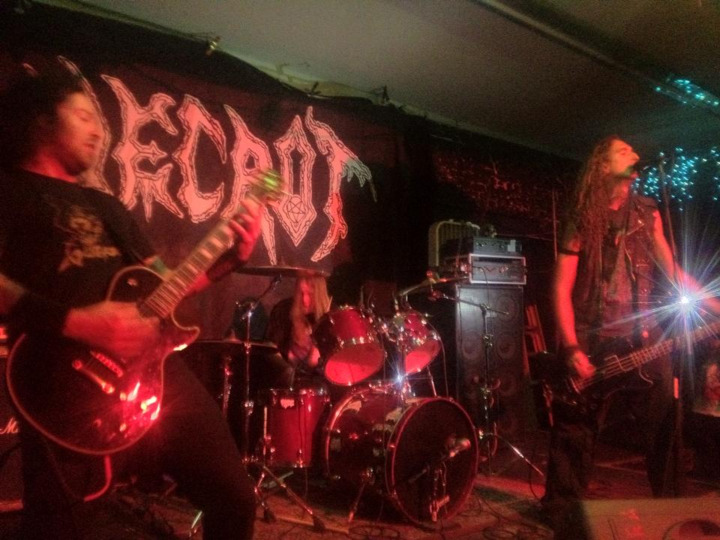 WC: When I hear Necrot, I can hear influences from Death, old Swedish death metal, Bolt Thrower. But are there any influences on your sound that are not as obvious or maybe not from metal at all? LI: Yeah! Definitely. I listen to a variety of music. A lot of it cannot be incorporated into metal, obviously, but I believe you can make something good when you use influences from everything you listen to. There’s a lot that goes into a song…there’s lyrics, there’s riffs, there’s song structure, there’s a multitude of tempos you can use. Some of that can come from other kinds of music you hear where the song structure is not as complicated as most death metal. I like to keep it simple, which is maybe more characteristic to other kinds of music. Another characteristic I like to have in metal is tempos which are not progressive metal or crazy technicality but which keep things interesting. WC: Did you get any influence from ethnic music, like Middle Eastern? LI: No, I wouldn’t say so. But in Middle Eastern music, they use a lot of half tone passages, which is common in death metal also. WC: You guys are involved in a lot of different bands and projects? How hard does that make it to keep Necrot going? LI: It’s very easy. We keep Necrot as our priority band so all our other bands work around it. WC: “Blood Offerings” is out on Tankcrimes Records. How did your deal with them come to pass? LI: They actually were coming to our shows pretty often. Scotty just came up to us at one of our shows and asked if they might be able to put out our records. We knew him personally from before and we’re friends with other Bay Area bands that are on Tankcrimes like Ghoul, Connoisseur and Brainoil. They had nothing but good things to say about Scotty. We’re really happy with them right now, I think they’re the perfect label for us. WC: Were there others that expressed interest in you? LI: When we played the Power of the Riff fest in Los Angeles, Greg Anderson from Southern Lord said he was interested in releasing Necrot. 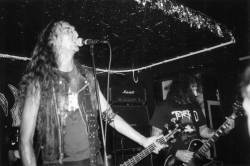 I worked with him before in my other band Acephalix. He’s an amazing person and his label is awesome but there’s no reason for us to look anywhere else right now. WC: The cover art on “Blood Offerings” remind a lot of the old Samael album “Blood Ritual”. Is that just a coincidence or was it a deliberate homage? LI: When we hired Marald, he wanted to do whatever he wanted on the cover. I sent him the lyrics and a rough mix of the album. We also sent him our older album “The Labyrinth”. He was inspired by the music and the lyrics and I’m sure he was eventually inspired by covers from classic death metal albums. I suspect that was probably an album that inspired him. WC: I suspect the there is a bit more to the meaning of the cover art and the title track than killing babies for Satan. Is it more of a metaphor? WC: What’s the idea behind that art? Is it people offering up their kids to war or corporations or what not? LI: It is a metaphor. We live in a world that sacrifices everything to money, capitalism, war. Children get killed for it. We live in a reality that is very terrifying. The blood offering is like a mother that gives birth to her child and by giving birth submits him to this reality of this world that runs pretty much on blood and war. WC: Is the lyrical inspiration for Necrot from real life subjects, is it inspired by books and film? LI: I would say it comes more from society. Real life mental issues of living in this fucked up reality. WC: Is their one song on the album that symbolizes it the best? LI: I like all the songs equally, I don’t think there is one that represents the album more than another. WC: You guys are getting ready to do a tour with Undergang. How stoked are you about that? LI: We’re very happy about that. We’re going to be on the road for a month with Undergang. They’re friends.We’ve toured with them before in Davey’s other band Phrenelith. They’re a killer band. I think the show’s are going to be intense. WC: I’d like to see your Chicago show where you play with Cianide. LI: That’s going to be an awesome night. We played Reggie’s last year with another old school band, Dr. Shrinker. That night we were also able to meet Nicko Cruncher from Eye Gouge. He actually died a few months after he saw us at that show but he liked us so much that he took off the Eye Gouge T-shirt he was wearing and gave it to me. We pretty much treat T-shirts like a sports team at the end of the game. WC: That’s what a lot of underground metal is like. When you follow a band, it’s like following a sports team. Has Necrot ever had a chance to play Europe or overseas? LI: We haven’t, but we’re going on a month tour there this October. WC: Are you headlining or playing with someone else? LI: We’ll be doing both. We’ll be touring by ourselves but we’ll be hitting a couple of festivals. One’s the Bloodshed Festival in Belgium and the other is Graveland, in Belgium or the Netherlands, I can’t remember which. Doomstar Booking is doing the booking of the tour. WC: Are there any new bands or up and coming bands you could recommend? LI: Oh definitely! There is Rude from Oakland and Mortuus from San Jose. Blood Incantation and Spectral Void from Denver are pretty good. Skullshitter and Trenchgrinder from Brooklyn, New York. There’s more. I don’t think they’re playing anymore, but Finnish band Slugathor was a really cool band. WC: Is the Bay Area where you are from becoming a hot spot now? LI: Yeah, I think it is. It has always been. It’s a big scene, people go to shows and keep it alive. LI: You mean people that died? WC: They can be alive or dead. LI: OK. Even if not related to music? WC: Yes, can be anybody. LI: OK, I would say maybe President Kennedy, Mr. Crowley and Chuck Schuldiner. WC: That would be an interesting group for sure! LI: Right! I wish I had more options! WC: What was the last CD or release you just because you wanted to hear the band? LI: The new Immolation record and the new Obituary. The Immolation I was most excited about. WC: What did you think of it? WC: In the history of Necrot, was there ever a Spinal tap moment where things went crazy that you could share with us? LI: I can tell you one of the soft stories, just not one of the hard ones! (laughs) I don’t want to go to jail! WC: We’ll skip that, then. Any last words for the fans out there? LI: Come to our shows. We’re going to try and get to as many people as we can, so come on out and see us live.